One thing WordPress users have grown accustomed to, is easy, no code required theme customization options. The idea is: download a theme, activate it in the Themes panel, access the Customize panel, and start tweaking the theme’s colors, layout, fonts, etc., with just a mouse click. WordPress offers theme developers the Customizer API. This is a clean, object-oriented set of methods that facilitate the creation of a consistent customization interface. On the Customize panel, users can easily make changes and live-preview them without having to mess with PHP or CSS code. Developing theme options using the Customizer API, while being a straightforward and logical process, involves writing a certain amount of repetitive code. To cut down on some of the steps required to build functioning and safe Customizer options, Aristeides Stathopoulos has been developing a free and open-source plugin, Kirki. In this post I’m going to show how to integrate Kirki into your WordPress theme and how to use it to build a few Customizer options. Kirki is not a framework. It’s a toolkit allowing WordPress developers to use the Customizer and take advantage of its advanced features and flexibility by abstracting the code and making it easier for everyone to create beautiful and meaningful user experiences. I’d like to drive home two points about this toolkit. Kirki does not replace the WordPress Customizer API. It creates a “wrapper for the default WordPress methods, simplifying the syntax and allowing you to write more with less code”. You can still use native Customizer methods alongside the Kirki API. Even better, you’re warmly advised to familiarize yourself with the Customizer API before approaching Kirki. If you’re looking for a useful introduction to the Customizer object, head over to Getting Started with the WordPress Theme Customization API by Narayan Prusty. Kirki is in a state of constant evolution and improvement, not unlike the WordPress Customizer itself. Therefore, any bug reports, or requests for new features, have their place in the GitHub repo, where you can download the development version of the plugin and contribute to its development. It’s time to see Kirki in action. If you want to follow along, have a WordPress theme ready or grab the Superminimal demo theme that contains all the code discussed in this post. Kirki is packaged as a WordPress plugin. As such, you can download it from the WordPress.org plugins repository, or directly from the backend of your WordPress installation, unzip it and activate it. If you prefer to include Kirki in your theme as a library, follow the steps outlined below. Copy the kirki directory into your theme’s folder. In the demo theme for this article, the Kirki files are located inside a directory called inc.
Make your theme ‘talk’ with Kirki by adding this line to functions.php (make sure you adjust the path to the kirki folder to match your theme’s file structure). Add a function to include the Kirki configuration options and hook it to the kirki/config filter. It’s up to you what you want to add to this function. For this post, let’s keep it to a minimum by adding the code Kirki needs in order to be ‘made aware’ of its new location, i.e. the theme’s folder rather than the plugin’s folder. It’s inside this configuration function that you can control the look and feel of the WordPress Customizer to match your theme. Most importantly, it’s here that you add the code necessary to make all strings used by the plugin translatable from within your theme. Have a look inside the Superminimal demo theme or the Kirki documentation page for some guidance on how to accomplish this. Kirki is now ready to help us build some Customizer options. You can use functions.php or create a dedicated file for the task, it’s up to you. Customizer options live inside Sections, which are optionally located inside Panels. In this article’s demo project I group all Sections inside a dedicated Panel using native Customizer methods, like so. 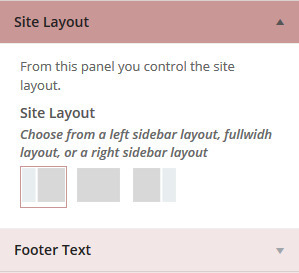 Next, add Sections for the site text colors, the site layout, and the footer text options respectively by placing this code just below the previous add_panel Customizer method. Now you’re ready to add the first Kirki-powered option. All your options-related code is to be placed inside a function. This function is then filtered through the kirki/fields filter. Let’s give your WordPress theme users an easy way to change text color. This is quickly done with Kirki. Add the following code snippet inside the superminimal_demo_fields() function, just above the return $fields; statement. Kirki offers a condensed syntax to add both a setting and a related control in one go. Let’s break down the $fields array. type refers to the specific control where users enter the value of their chosen option, in this case the Color control. setting refers to the id of the Customizer setting that handles live-previewing, saving, and sanitization of the Customizer objects. label and description are there to communicate with users. The label displays a title for the option and the description offers some indication of what the option does. section refers to the id of the Section that hosts this specific Color control. priority refers to the position of this specific Color control with respect to other controls inside the same Section. default is set to the default CSS color value. Finally, output is the awesome Kirki way of applying the setting’s value. Just feed it the CSS selector and property, and Kirki handles all the necessary operations. Following the example above, you could go ahead and add a color option for links as well. Next, let’s give users of your theme the option to customize the site layout. Kirki offers a bunch of sophisticated Customizer controls. My favorite one is the radio image control. Here’s how you can add it to your theme to offer users the option of changing the layout of their site. Place the code above just after the previous $fields array snippet. Notice how no output parameter has been added to the code. This is so because the value of each radio image input is not a CSS property value. The way you can extract the value from the superminimal_layout setting is by the native Customizer get_theme_mod method. You then use that value as a class attribute’s value of a suitable HTML element in the template file. Finally, it’s just a matter of writing the appropriate CSS to achieve the desired layout for the .fullwidth, .sidebar-left, and .sidebar-right classes in your stylesheet. Check out the details of how to implement the layout option in the Superminimal demo theme. 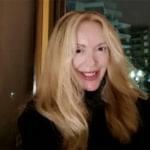 How many times have you come across WordPress theme users asking you to help them replace whatever developers stuff in their theme’s footer area? 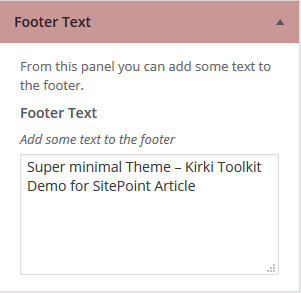 Adding an option to let users easily manage the footer text from the Customizer takes a couple of minutes with Kirki. Here’s the code. The code above outputs a textarea where users can write copyright notices, credits, etc. To extract and display the text entered in the textarea, use the native Customizer method get_theme_mod in footer.php as follows. Next, let’s check out what more Kirki can do to improve the user experience with the WordPress Customizer. As a theme designer, you don’t like to overwhelm users with a plethora of confusing options. Some choices don’t need to be made until users pick some specific option. The Customizer offers the handy active_callback parameter for Panels, Sections and Controls. You can set this parameter to a specific condition that must be met before a Panel, Section, or Control is displayed in the Customizer. What has Kirki to offer in this respect? The Kirki API uses the required parameter to hide or show a control in the Customizer on the basis of the value of another control. 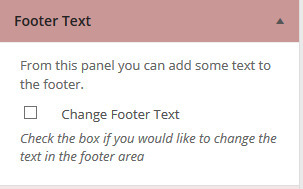 For example, let’s say you’d like to show the textarea to let users modify the footer text only if they check a checkbox. To accomplish this, add the following code to the superminimal_footer_text control. Adding the snippet above to the code for the textarea control ensures that the superminimal_reveal_footer_text control’s value is to be equal to 1 before the textarea control is displayed in the Customizer. Let’s add the superminimal_reveal_footer_text control to the superminimal_demo_fields() function. The superminimal_reveal_footer_text control is a checkbox that by default is set to 0, that is, it’s unchecked. This prevents the textarea from being displayed. Only after checking the checkbox, that is, by changing its value from 0 to 1, does the textarea appear in the Customizer. We can accomplish the same result with Kirki simply by adding a few handy parameters to the $fields array. For example, to add an ajaxified live preview to the superminimal_body_color setting, append the following snippet to the appropriate $fields array. Let me explain what the code above does. Next, the js_vars parameter values indicate that the body and p elements are to be modified using the CSS color property. Kirki offers two pre-defined values for the function parameter. Use the css value if the setting you’re adding stores CSS rules like background-color, color, font-size, etc. Use the html value if the setting stores a string of HTML markup to be inserted into the page. As example of how you can use the html value, let’s add AJAX live preview functionality to the setting that manages changes to the footer text. Append this snippet at the end of the $fields array that contains the superminimal_footer_text setting. That’s it, go and try writing something in the textarea inside the superminimal_footer_text section. You’ll soon notice the corresponding footer text in the preview screen change accordingly without a complete page reload. Cool! There may be cases where neither css nor html are a good fit for the function parameter that enables AJAX live preview. A case in point is the setting for changing the site layout. Using css as the value for the function parameter doesn’t make much sense because the setting in question doesn’t store any CSS property value. Likewise, using html doesn’t quite cut it. In fact, it’ll only end up spitting out fullwidth, sidebar-left, or sidebar-right on the preview page, depending on which radio-image control button is selected. But this can’t be what you’d like to accomplish. The great thing about Kirki is that you can use it together with, rather than in place of, the WordPress Customizer API. Therefore, where the situation requires it, you can easily switch between the two APIs in no time. Hungry for more? Here’s some great resources. Building WordPress Themes Using the Kirki Customizer, by Aristeides Stathopoulos. Theme Options – The Customizer API, from the WordPress.org Theme Handbook. 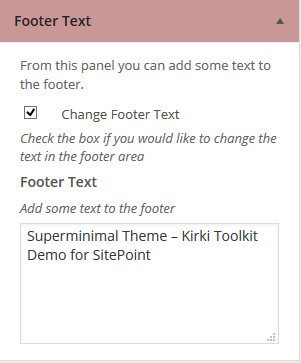 I’ve shown how to integrate the Kirki Toolkit into a WordPress theme. Kirki is actively being developed and supported. Its API and custom controls already significantly optimize the time it takes to develop Customizer theme options. This becomes especially important if you’re looking to have your theme listed in the WordPress.org themes repository. In fact, themes that provide customization options are required to do so via the Customizer rather than custom options pages. To delve into the details of the code discussed in this post, feel free to download the Superminimal demo theme from GitHub.